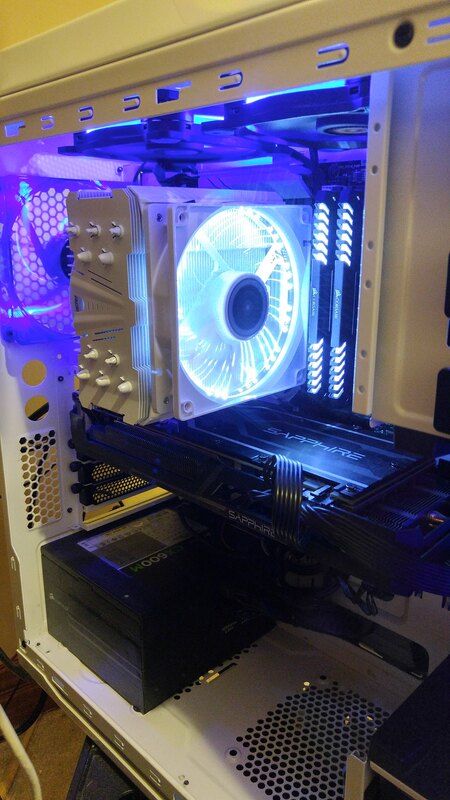 I've actually changed both the CPU Cooler & Rear Exhaust fan to matching Corsair fans now with the White rings. That would warrant concern for where I put my drink. Surprised nobody has picked up on my "RAPOO" keyboard yet"
Really nice case,Although it has its design flaws,not sure how Corsair failed on these. 1.Rear of the motherboard panel,hardly any room to run wires at the back,yet alone close the side panel!..they should have made it a bit deeper. 2.Top of the case is magnetic dust filter,problem with this if you were to put a rad up there it gets choked and is noisy with the filter on,plus it holds in the heat..i tested it with my H60 rad up to and it was choked,Soon as i taken off the dust filter temps went right down but of course it doesn't look right without the top on. Oh dude,you would not believable the amount of times ive cached my cup and knocked over my drink on this desk. It looks as if they want to force you to attach a rad to the front of the case but if there is any kind of choking going on with a filter, then thats no good. NO cable management space???? Ah, heck nah... I have to shove that birds nest of wires somewhere, specially with a window on the side to show off the goods. My keyboard has pretty much tasted every drink I've had on my desk. Resilient thing, I tell ya. Yeah thats what i thought,The problem with that is the tube length,On my H60 it wouldn't of reached from the CPU to the front of the case as the tubes just was not long enough,Not a problem for custom water cooling but for a AIO i dont think many will reach,So it was either attach it to the rear exhaust or up the top. In the end though i wasn't happy with the temps i was getting from my aging H60 so went with this Cooler master Air cooling,much better. @Saucybreakfast I do believe I've heard a few of those drinks go down in Discord. I need some better pictures with my new cooler. All I got atm. That setup with the H60 is exactly how my current rig is setup. Though I really need to get my H100i into it so I can get some lower temps. Gonna switch over the H60 to my testbench. You need to figure out how to do quotes boy. This gives a better idea of how it actually looks but obviously the rest of the case isn't that dark. Pretty hard to get a good picture of. 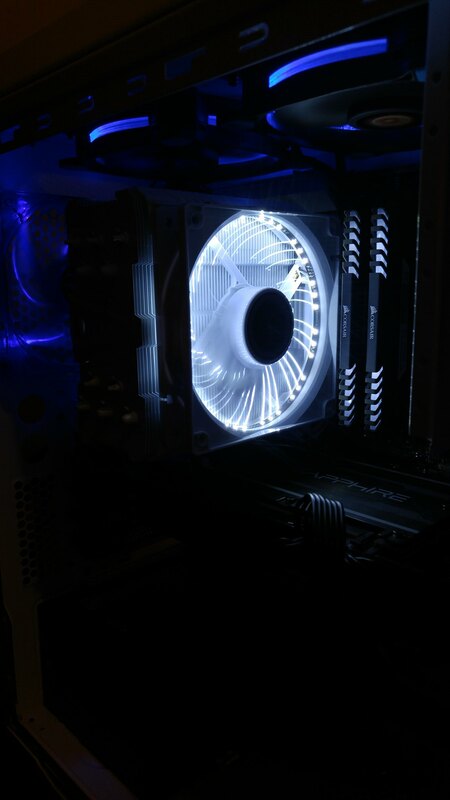 I also have it on a kind of "pulse" mode where the lights turn on and off so fast it makes the fan looks like it's spinning really slowly or not even at all. Kinda hard to explain. It doesn't look like it's flashing, and all those lines are just the lights around the edge reflecting off the blades (which are half transparent half solid to get that effect). Nice cooler, was just looking at the black one. 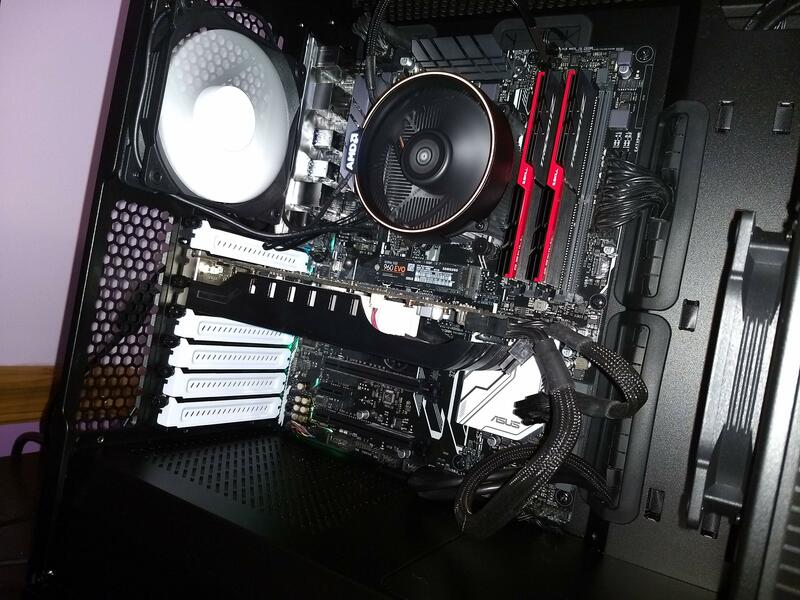 Nice looking systems guys,They should start making more cases with vertical mounts for the graphics card,like in the case above there is the room for it on the left,I think they look much nicer when you can see the whole card,plus completely eliminates the card sagging. PCI-e risers + vertical mounts are cool... but a lot of the current ones don't come with a long enough riser... so it just blocks all the pci-e slots below.